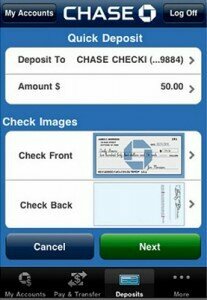 Earlier this year Chase Bank updated their mobile app to include some pretty cool features. As of now the application is only available on the iPhone, but look for it to be released on the Android market in early December. There are two new features that make this app a must have for Chase customers. 1. Deposit Checks with Your Camera. Instead of driving to the bank to deposit your check now all you need to do is take a picture of the front and back of the check press send and your funds will be deposited. The app makes an attempt to recognize the routing number and account information on the check from the picture. If the information is unreadable to the camera you can manually input the numbers. The funds will remain as pending until Chase processes the transaction. If you want to use this feature you will have to enroll in Chase Quick Deposit which is a free service, just like the app itself is free. 2. Send money quickly and securely. If you sign up for the free Chase QuickPay service, which is similar to Paypal, you will be able to send funds with your phone to other people with as little information as just an email address. Neither the sender nor the receiver of the funds will be charged and the recipient does not need to be a Chase customer. Looks like Android will be minus the QuickPay option at this point, but none the less this great banking app will be released to just about everyone now.